As Dieter correctly guessed, my previous photo was of the inside of one of the Table Mountain Aerial Cableway's cable cars. This photo is of the cable car birthing in its lower docking station. 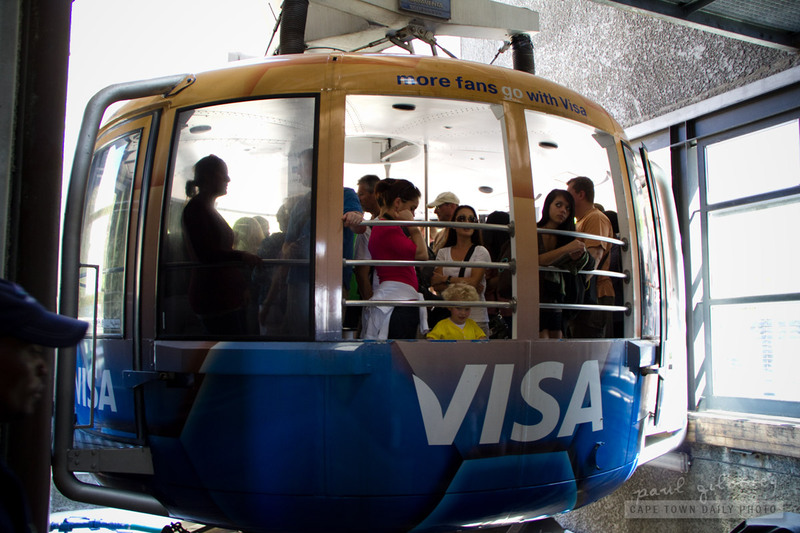 It's difficult for me to imagine that a cable car of this size is able to fit 65 people. Once everyone's inside there's not a lot of place to move around, but fortunately there's enough space so that it doesn't feel as though you're a sardine in a tin! Posted in Activities and tagged table mountain on Monday, 24 October, 2011 by Paul. Gosh, I rode that once and, if I am lucky, I will get to do it again. Thanks for the memories.